Fair Traceable Multi-Group Signatures | Network, Information and Computer Security Lab. 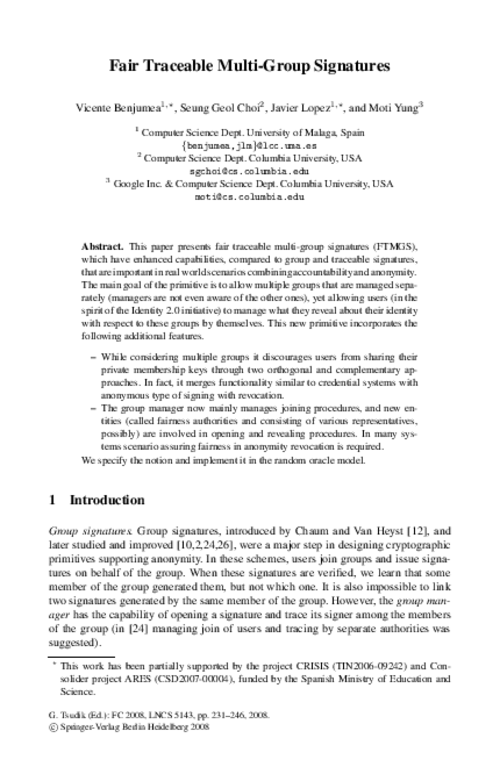 This paper presents fair traceable multi-group signatures (FTMGS) which have enhanced capabilities compared to group and traceable signatures that are important in real world scenarios combining accountability and anonymity. The main goal of the primitive is to allow multi groups that are managed separately (managers are not even aware of the other ones), yet allowing users (in the spirit of the Identity 2.0 initiative) to manage what they reveal about their identity with respect to these groups by themselves. This new primitive incorporates the following additional features: (a) While considering multiple groups it discourages users from sharing their private membership keys through two orthogonal and complementary approaches. In fact, it merges functionality similar to credential systems with anonymous type of signing with revocation. (b) The group manager now mainly manages joining procedures, and new entities (called fairness authorities and consisting of various representatives, possibly) are involved in opening and revealing procedures. In many systems scenario assuring fairness in anonymity revocation is required.We specify the notion and implement it with a security proof of its properties (in the ROM).